After Criminal Justice School in Alabama: What's Next? With various academic and training programs to choose from, criminal justice students in Alabama have plenty of post-secondary educational options. But who is the best? 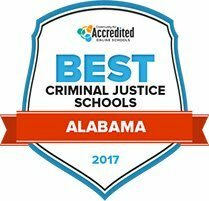 This list shows the best criminal justice schools in Alabama, ranked on common essential factors, such as cost and graduation rates. Although specializations within the field and areas of study differ from program to program, these schools provide the best combination of major factors below. Prospective students can see how each stacks up to help narrow their school search. At Northeast Alabama Community College, students interested in earning an associate of science degree in criminal justice will receive an encompassing education that will lead to excellent career opportunities. Established in 1965, NACC offers intensive and updated programs of study ranging over a variety of fields, ensuring any student enrolled there will be able to study what interests them. Student benefits including financial aid coverage, veteran's services, and on-campus tutoring, are available to anyone enrolled at NACC. The staff at NACC is also available to help prepare students for job placement through skills training and workforce development. Criminal justice students enrolled at Wallace Community College, Dothan, will receive a comprehensive education outlining all necessary points of study for success in their field: administration of law and order, investigative skills, and the gathering of crucial evidence. WCC has been providing students with routes to their careers of choice for nearly 70 years and employs only the most experienced faculty members. Students attending WCC will make lifetime bonds with their peers and will be able to socialize through student-operated clubs, campus events, and in-depth classroom discussions. WCC offers an education at an affordable price, but also strives to provide financial assistance to any qualifying student. An associate of applied science degree in criminal justice earned at Wallace State Community College, Hanceville, will help to guarantee potential law enforcement officers a job once they have graduated. Students will progress through a rigorous five-semester program taught by faculty members with several years of on-the-job experience. For students who have previous obligations outside of school, WSCC offers many of its classes in an online format that allow busy students to complete their work at a pace with which they are comfortable. Students will also be able to progress through their program more efficiently by utilizing evening, weekend, winter, and summer classes. Lawson State Community College was established in 1947 and has been educated countless successful since its doors were opened. A student interested in criminal justice, homeland security, or criminology will have the opportunity to progress through one of LSCC's associate's programs, helping to ensure that they will be prepared for the careers that lie in their future. Students who feel they are getting off track will have the option to visit with one of LSCC's experienced academic advisors who will be happy to develop an education plan to get the student on the right path to graduation. Students enrolled at Jefferson State Community College will be able to pursue either an associate of applied science degree or an associate of science degree in criminal justice. Students studying under the AS degree will have the opportunity to transfer to a four-year institution after graduating, ultimately putting them on the path to a receiving a bachelor's degree. Students who have studied at a previous institution may be able to receive credit for their prior coursework, helping to ensure a student will have to backtrack as little as possible. Career services are available at JSCC will help students to identify their career aspirations and find the best academic path that might help them to achieve that goal. Through the University of Alabama Birmingham's Department of Justice Sciences, students can pursue both undergraduate and graduate degrees in criminal justice, with minors available in criminal justice, legal affairs, forensic science and forensic psychology, along with a pre-law program. Students of the criminal justice bachelor's degree program will complete the program with internship/capstone experience in their chosen area of interest. Graduates of the bachelor's program can begin working in the criminal justice field at the local, state or federal level, in areas such as law enforcement, corrections, security, rehabilitation and counseling, or may go on to earn a master's degree or enter law school. Alabama State University (ASU) has several undergraduate degree options for students interested in studying criminal justice. ASU offers a bachelor of science in criminal justice with concentrations in corrections, juvenile justice and law enforcement and criminology, along with minors in geography, sociology and criminal justice. Criminal justice students can earn a teaching certificate in social science through ASU's Department of Education. These programs prepare students for graduate studies and employment in areas such as criminal justice, law, government, social work, education and business. ASU students interested in corrections can train to be correction officers while working on their degree, through a partnership with the Alabama Department of Corrections. Amridge University is a private Christian university offering a bachelor's degree in criminal justice. The program consists of general education, elective and degree specific courses, along with a capstone course towards the end of the program. For students needing extra flexibility, several courses are offered online or in a hybrid format, and several outside credits may be transferable and used towards a criminal justice degree. Upon graduation, students may decide to earn a graduate degree, or seek work in the criminal justice field in areas such as law enforcement, cyber security, non-profit organizations, investigations, parole, probation and prison ministry. For those interested in pursuing a career in criminal justice, Troy University has several degree options, with both online and on-campus programs available. Students can minor or major in criminal justice, with concentrations in criminal justice, homeland security, or digital forensics. Troy also offers a Master of Science in Criminal Justice degree, with either thesis or capstone components, along with a certificate program in cybersecurity. Non-criminal justice bachelor's degree students can be admitted into the master's program, with possible additional course work or related experience required for admission. Graduates of Troy typically work in areas such as security, corrections, the court system and law enforcement. Faulkner University is a Christian university that offers a bachelor's degree in criminal justice and a master's degree in justice administration, with online and hybrid program options available. The bachelor's program curriculum focuses mainly on the areas of law enforcement, corrections, security and pre-law, while also providing an academic foundation for graduate and law school. Students currently working in corrections or law enforcement can earn general education credits towards their degree for work experience, or students can transfer in general education credits towards an accelerated program. The fully online master's degree program is excellent for students looking to advance their criminal justice career. Narrowing down potential programs can be daunting for students. With multiple options across many criminal justice specializations in Alabama, the first step is to identify which factors are most important. This varies student to student, which is why this search tool breaks down important data like student-teacher ratios, placement services and student population in addition to tuition costs and financial aid. Find the right criminal justice school in Alabama by searching here. As students narrow down their criminal justice school options, they should also consider the specific careers that they'd like their degree to lead to, and whether or not they plan to pursue those careers in Alabama. Understanding interests within the field of criminal justice can help students determine what type of school they need to attend, and what degree level to earn. Take a look at the most popular criminal justice careers in Alabama below to better understand earning potential and educational requirements specific to the state. In addition to seeing how potential careers might pan out in Alabama specifically, aspiring criminal justice students should also consider how their degree will serve their careers measured against the national average, both in salary and potential growth. Some careers post higher numbers in Alabama, while others show more promising options elsewhere. As students explore their criminal justice school options in the state, they can also reference this graph for Alabama-specific degree requirements by job. Students graduating from criminal justice schools in Alabama have a number of in-state options as they begin to pursue careers. Potential criminal justice professionals can look at the amount of earning potential in their field of specialization, and note how many other people are in those jobs by location with the map below. A great networking system for compliance officers in the nonprofit world, this member-based organization holds high standards for the state's nonprofit sector. The benefits of this membership include increasing resources, learning leadership and fostering collaboration, among many others. A one-stop-shop for all things related to starting a business in Alabama and maintaining standards of compliance with the state. It has a web application for taxes, sections for business and individuals and a practitioner section for pros. Complying with the Occupational Safety and Health Act is an important step for businesses to meet full operating standards. Each state's standards are a bit different, so professionals should be aware of the specific regulations for Alabama. From the U.S. Small Business Administration, this guide includes a feature article, advice and counseling on starting up a business, and information on capital and advocacy. Compliance officers should familiarize themselves with this information as it may come in handy during their work. This non-profit was formed with the goal of identifying and lobbying for the interests and concerns of correctional organizations in Alabama. Its second focus, listed under Section 2 in its constitution, is to provide an opportunity for active participation in professional development for those employed in the field. It is member based, and provides a network for those professionals. Those interested in becoming corrections officers for the State of Alabama have a hub of resources here at the DOC. This site has instructions on how to apply, listing details on qualifications, requirements and career advancement. A member-based organization, AMCCMA was formed in 1989 to promote education and professionalism within the municipal courts. This site provides network opportunities abound, as well as employment and continuing education information. A quick-link resource for the judicial circuits of the state, including contact information. This page also includes information for appellate, municipal and specialty courts, as well as an online portal for assistance. This resource has everything a young judge would want to know about the highest court in the state. Contact information is listed for each of the nine judges, as well as all appellate courts' information. Find details on rule changes and recent articles on decisions the court is making here as well. There are more than 200 members of this organization across the state, creating a large network of professionals with similar backgrounds, challenges and goals. This non-profit serves to promote the profession through awareness and education. Future parole officers will take a great deal away from this site. It has a wealth of information on how prisoners are paroled, and how they are rehabilitated to return to the community. ADR is a non-profit that was organized to manage alternative dispute resolution in the courts, neighborhoods, educational facilities and government agencies within Alabama. It operates under the supervision of the Alabama Supreme Court Commission on Dispute Resolution, as well as in conjunction with the Alabama State Bar Dispute Resolution Section. Each state has a chapter of this national group, and this page covers Alabama. Legal professionals can find and build an outstanding network of lawyers and activists, as well as find volunteer and advocacy opportunities. AACOP promotes excellence in law enforcement, and has since 1972. The organization has continuing education and scholarship information for students entering the field. Trainings and events are also available through this page. This is the primary site for public use, and prospective law enforcement professionals can find a lot of information on trainings, activities, special events and communications that come from the agency here. The "grandfather of law enforcement agencies in the state", the APOA is a member-based organization that looks out for the interests of all in law enforcement. Police officers, corrections officers, troopers, etc., can all find benefits from an APOA membership, and find more information on pay out benefits for families of officers killed in the line of duty. A member-based organization, APIA focuses on continuing education for Alabama PI's through conferences, meetings and additional courses. It is open to any licensed investigator, even those from other states and countries. ACEOA is a member-based nonprofit founded by conservation officers. The organization represents five divisions: wildlife and freshwater fisheries, marine police, marine resources, state lands and state parks. It also offers member- and non-member scholarships. A resource for all environment-related information, ADEM has certification programs, permitting authority and information on compliance. It lists all rules and regulations for the state's environment, and has special publications that it periodically releases. This is the Alabama Department of Conservation and Natural Resources, more amiably shortened to Outdoor Alabama. It includes information to fish and game wardens, as well as contact information for each district in the state.